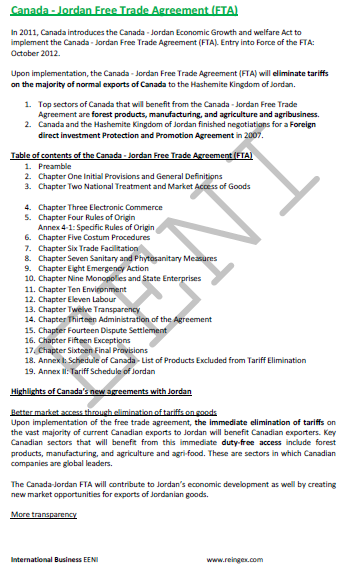 Syllabus of the Online Course (Subject): Canada-Jordan Free Trade Agreement (FTA). Description of the Online Course: Canada-Jordan Free Trade Agreement (FTA). Entry into force: October 2012. Canada and the Hashemite Kingdom of Jordan finished negotiations for a Foreign Direct Investment Protection and Promotion Agreement in 2007. Foreign Trade between Jordan and Canada. Canada belongs to North American Economic Area (Western Christian Civilisation) and Jordan to Islamic Civilisation.